There are numerous benefits associated with vinyl fencing, from curb appeal to durability to longevity and, of course, Low Maintenance. However, you have to remember that low maintenance is not NO maintenance. Even your Vinyl Fence will require a little tender love and care from time to time. Fortunately, vinyl fences are easy to maintain, simply requiring cleaning from time to time. Removing Dirt: Step one involves grabbing your garden hose and spraying that stuck on dirt and grime off of your vinyl fence. This should remove almost everything. However, if there is a trouble spot or two, it may be best to grab the good ole’ power washer. Dealing with Scuff Marks: Scuff marks can really detract from the beauty of your vinyl fence. Luckily, removing scuff marks is easy. Grab a wedge-shaped pencil eraser and simply erase those eyesores away! Ridding Your Fence of Paint Marks: Occasionally you may accidently drip paint on your beautiful vinyl fence. Fortunately, there is a solution. Grab a plastic scraper and gently scrape the paint away. If this doesn’t get everything, try applying a thin coat of paint thinner. That should do the trick. Removing Mold: Mold is a real eyesore. Fortunately, like all of the other blemishes we have addressed, it is also fairly easy to deal with. Mix water, biodegradable soap, white vinegar, and tea tree oil to naturally kill mold and mildew. Hopefully you have found these tips for Cleaning a Low Maintenance Vinyl Fence helpful. If you would like to know more about vinyl fences, or if you have any questions about Cleaning a Low Maintenance Vinyl Fence, you can contact Hercules Fence of Manassas, Virginia today by calling (703)551-2609 or visiting our website. Also, check out Hercules Fence of Manassas on Facebook, Twitter, Google+ and YouTube! 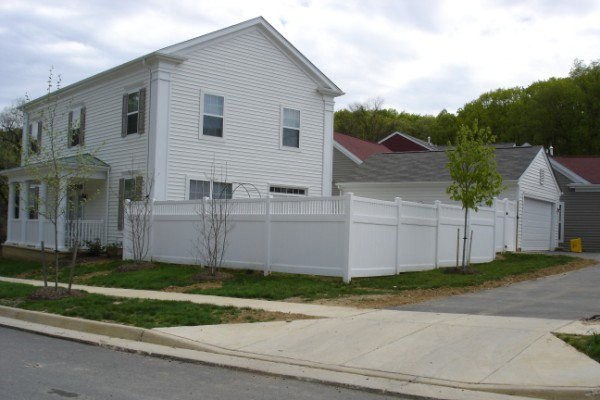 For more than 50 years, Hercules Fence has been providing exceptional fence services to the people of Northern Virginia and the surrounding area. Over the years, we have developed a reputation for professional service and quality installation. Our experienced sales and installation staff can handle any of your fencing needs. This entry was posted on Friday, May 24th, 2013 at 3:28 pm. Both comments and pings are currently closed.